Ischiogluteal tendinopathy or Ischiogluteal tendinitis is inflammation, or degeneration of the hamstring tendon causing pain just below the buttocks at the top of the thigh. Ischiogluteal bursitis is inflammation of the bursa that lies between the tendon and bone. Both conditions have similar symptoms or may occur at the same time. Ischiogluteal bursitis is inflammation of the bursa which lies between the hamstring tendon and the bone. The bursa is there to reduce friction between the tendon and the bone and it may be inflamed on its own or in conjunction with hamstring tendinitis or inflammation of the tendon. The symptoms of ischiogluteal bursitis are almost identical to hamstring tendon inflammation and include pain and tenderness at the ischial tuberosity and pain when stretching the hamstring muscles. Pain may occur gradually over time, where the athlete cannot pinpoint exactly when the injury happened or following a sprint training session. It is likely to be aggravated by prolonged sitting, especially on hard surfaces. Pain will be felt when stretching the hamstring muscles but sometimes bursitis is not painful when contracting the hamstring muscle against resistance. It is not usually possible to palpate or feel the bursa but an MRI scan or Ultrasound scan will confirm the diagnosis. Rest. Apply ice or cold therapy to reduce pain and inflammation. See a doctor or physiotherapist if symptoms persist. Carry out hamstring strengthening and rehabilitation as pain may have caused weakness through muscle inhibition. A doctor or physiotherapist can differentiate between hamstring tendinitis and ischiogluteal bursitis. This may involve analysing the effectiveness of treatment such as deep tissue massage. Bursitis will not respond to massage and may become worse following treatment. Inject a corticosteroid and local anesthetic into a fluid-filled bursa. Advise on hamstring strengthening. Hamstring tendinitis is inflammation of the hamstring tendon as it attaches to the ischial tuberosity at the top of the back of the thigh. This hamstring injury can be linked to overuse or a tear of the hamstring tendon which hasn’t properly healed. Pain may come on gradually, especially after activity, and stretching the hamstrings is likely to be painful. 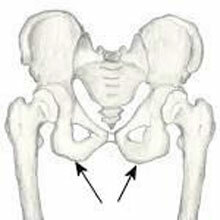 Symptoms include pain and tenderness at the ischial tuberosity just under the buttocks. The patient may experience a gradual onset of deep buttock or thigh pain following a sprinting session. Pain is likely to be felt when stretching the hamstring muscles and becomes worse with exercise, particularly repetitive exercises like long-distance running. An MRI can confirm the diagnosis. Hamstring tendinitis is inflammation of the hamstring tendon as it attaches to the ischial tuberosity at the top of the back of the thigh. It can follow a tear of the hamstring tendon which is poorly treated or more often is an overuse injury. The term tendinopathy probably describes the condition more accurately as tendonitis infers there is an acute inflammation of the tendon, which is not always the case, especially in long term chronic injuries. 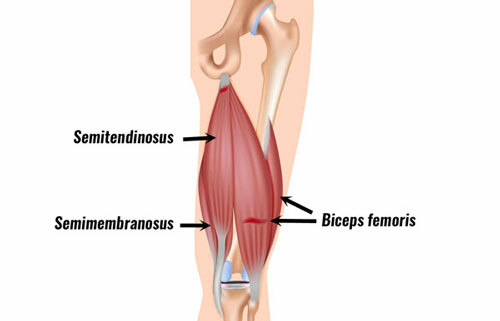 There is three hamstring muscles, the semimembranosus, semitendinosus and biceps femoris muscle. Reduce inflammation through rest, ice or cold therapy. Once pain and inflammation have gone develop a stretching and strengthening program. For chronic hamstring tendon injuries, there is likely to be muscle tightness and weakness which can be treated through massage, stretching and strengthening. A doctor or physiotherapist may recommend NSAID’s or nonsteroidal anti-inflammatory drugs to reduce pain and inflammation as well as use electrotherapy such as ultrasound. They may apply deep tissue sports massage techniques once the acute stage has passed. This is thought to be the most effective form of treatment for this condition. However, if ischiogluteal bursitis is a problem then massage is will not help. A full rehabilitation program of stretching and strengthening exercises is important to avoid future injury. If conservative treatment methods fail to be effective then ultrasound-guided corticosteroid injections with a local anesthetic may be effective in the short term but on its own is not likely to be effective long term. Shockwave therapy is also a treatment option if conservative methods fail. Occasionally fibrous adhesion’s may develop on the tendon in chronic cases. These fibrous adhesions can irritate the sciatic nerve as it passes above the Ischial tuberosity and then down past the biceps femoris muscle. These adhesions may not respond to deep friction massage and stretching. This condition is known as hamstring syndrome and may require surgery. For information purposes only. We recommend seeking professional advice. The following are progress hamstring strengthening exercises. Exercises should always be done pain-free. Where you start and how fast you progress will depend on how bad your injury is and how long ago it was injured. The athlete lies on their front in the prone position. The partner or therapist provides resistance as the athlete contracts the hamstring muscles, hold for 3 or 4 seconds then relaxes. The angle of knee flexion is changed and the exercise repeated. Once a range of angles have been worked the whole process is repeated with the foot first turned first inwards then outwards. This exercise targets the inner and outer hamstring muscles at varying angles of flexion or knee bend. This should be done pain-free both during, afterward as well as the next day. A little bit of natural muscle soreness the following day is OK but if it is uncomfortable then take a step back. Again begin with 1 set of 10 reps and build up each day to 3 sets of 15 reps. An ankle weight can be used to increase the load on the muscle. The athlete lies on their back, knees bent and pushes the hips upwards to work the gluteal muscles and hamstrings. Use both feet on the floor pushing up, to begin with. Hold the position briefly and then lower. Begin with 3 sets of 8 reps building to 3 sets of 12 reps then progress the exercise to single leg bridges. This is a deceptively difficult exercise which works the hamstring muscles specifically in a very contracted close range of movement. One end of a resistance band is tied to a fixed point or held by a partner and the other end secured to the foot. The athlete pulls the heel into the buttocks contracting the hamstring muscle to do so. Aim for 3 sets of 8 reps to begin building up to 3 sets of 12 or 15. This is another deceptively difficult hamstring exercise which looks easy at first glance. However, with this one, it is important to judge muscle soreness the next day before overdoing this one. It works the hamstring muscles in a very stretched position, particularly the muscle fibers nearer the buttocks. Another deceptively difficult exercise which looks easy but checking the level of muscle soreness the next day is important before doing too many of these is important. This exercise is a more advanced version of the single leg ball pick up and works the lower back and hamstring muscles eccentrically, especially the fibers towards the top of the thigh. The athlete bends forwards at the waist keeping the back straight. This also works the hamstrings as they stretch. One of the most advanced hamstring exercises. The athlete kneels down while the therapist holds the ankles. They then slowly lean forwards as far as they can under control using the hamstrings to resist the forward’s movement. A super advanced version of this is to use the hamstrings to curl back up again.